All pets listed here ARE Currently Available for Adoption. 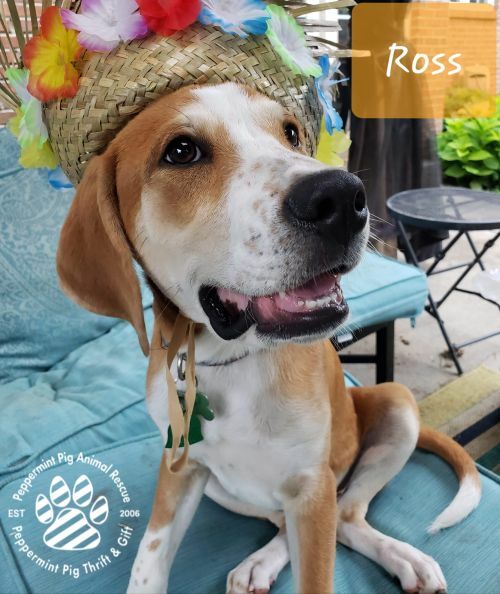 We post all of our adoptable rescue pets as soon as they become available for adoption, and we update their status regularly, so you never have to wonder who is, or isn’t, available. Wish to adopt a forever friend? 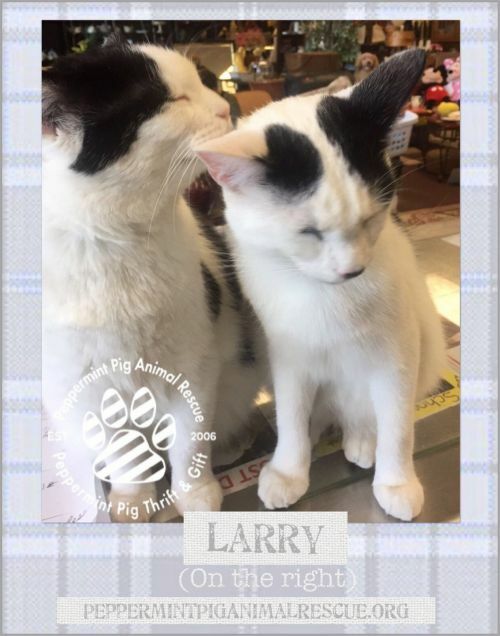 Adoptions take place most Saturdays from 1:00 pm to 4:00 pm at the Peppermint Pig Thrift & Gift Shop, 8255 Beechmont Avenue, Cincinnati, OH 45255. (Just west of Eight Mile Road). 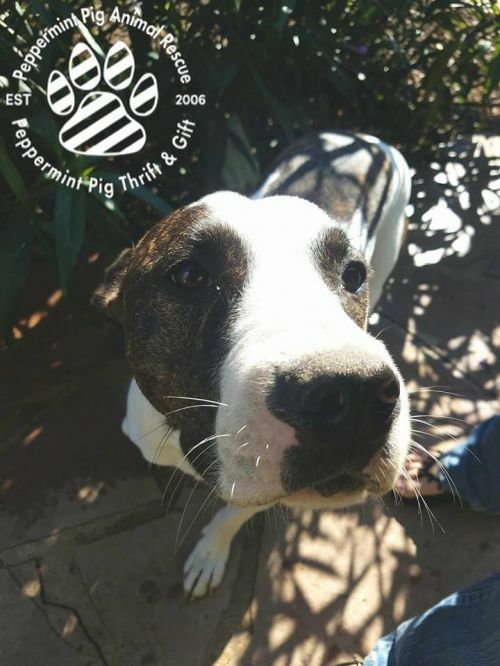 This Agreement between Peppermint Pig Animal Rescue (PPAR) and Adopter is to cover a trial dog adoption. There will be a trial visit of seven days. 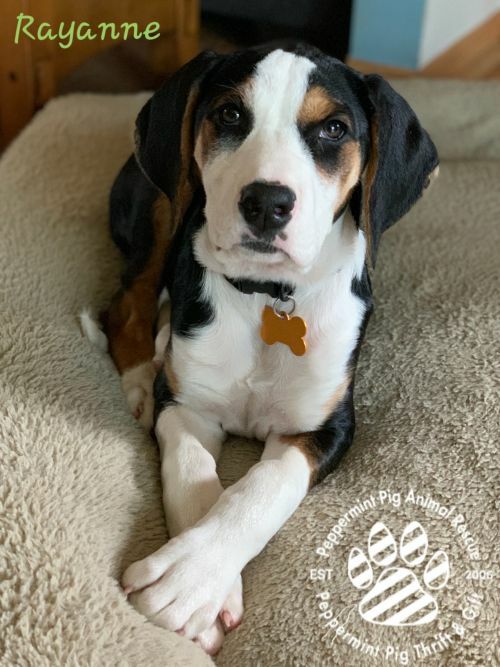 The purpose of this "trial visit adoption" is to determine that the dog in question is or is not acceptable as a pet in the Adopter's household. If the Adopter finds the dog is not suitable during this trial period, Adopter must notify PPAR in order to arrange a mutually agreeable date/time for the dog's return. The Adoption Fee given at the start of the "trial adoption" will be returned to the Adopter upon return of the dog, in its original condition as of the start of the "trial visit." 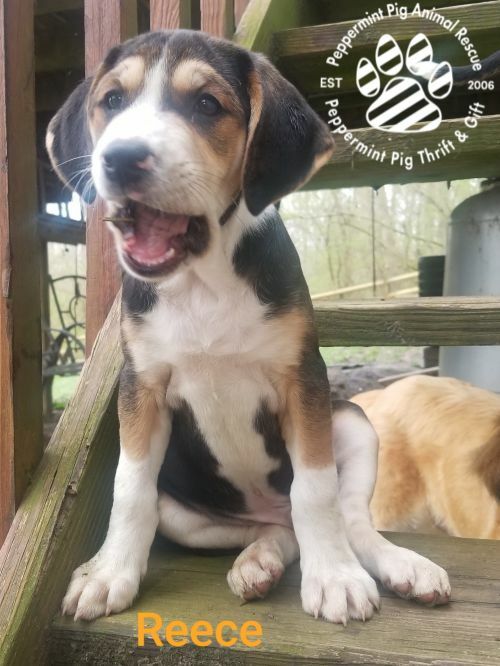 PPAR will provide initial vaccinations, micro-chipping, de-worming, spay/neuter, any initial vet care and one month of flea/tick prevention and heartworm medication. Once the animal is adopted the owner assumes the cost of all vet care. 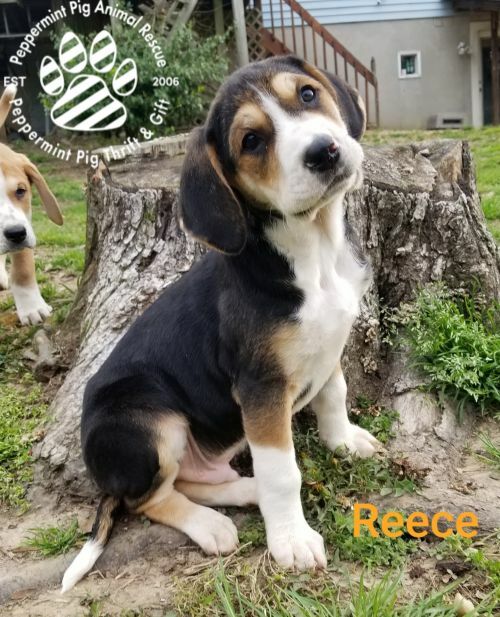 Adopter specificially waives any and all liability of PPAR concerning the dog's behavior, temperament and health during said trial visit and after any subsequent adoption. 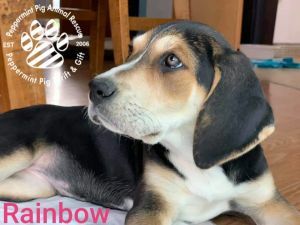 Adopter may inform PPAR of his desire to complete the transaction and finalize the adoption of the dog at any time during the "trial visit" by notifying PPAR. 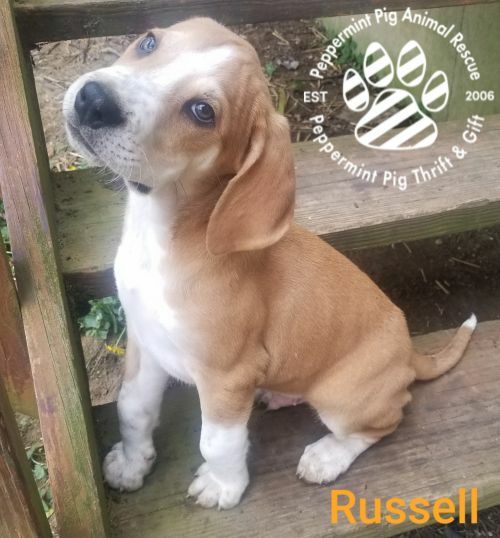 The agreed upon Adoption Fee begins at $95.00 and up being held by PPAR during the "trial adoption" period will then be deposited. PPAR will in turn deliver any appropriate medical documentation of the dog. 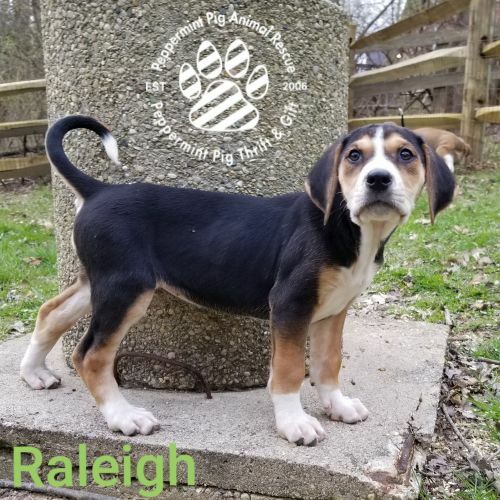 The adoption will automatically become final at the end of the trial visit period, if the Adopter has not notified PPAR of the need to return the dog. The Adoption Donation will then be deposited. To spay/neuter this dog if not already done at the time of the adoption, and agrees not to breed this dog. To keep this dog as an "inside" dog and to make it a loved part of the household. 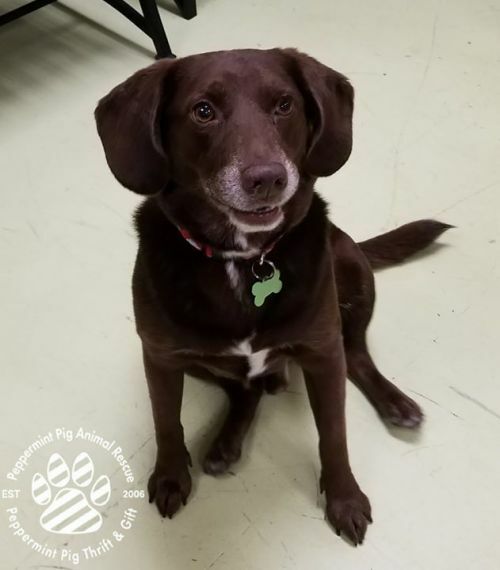 To provide a regular program of veterinary care for this dog, including, but not limited to annual wellness exams, vaccinations, heartworm prevention, and other testing as recommended by the veterinarian. To obtain and keep the appropriate county dog license and an ID tag on the dog's collar which the dog will wear at all times. Lack of proper ID is a primary cause for lost dogs not being returned to owners. 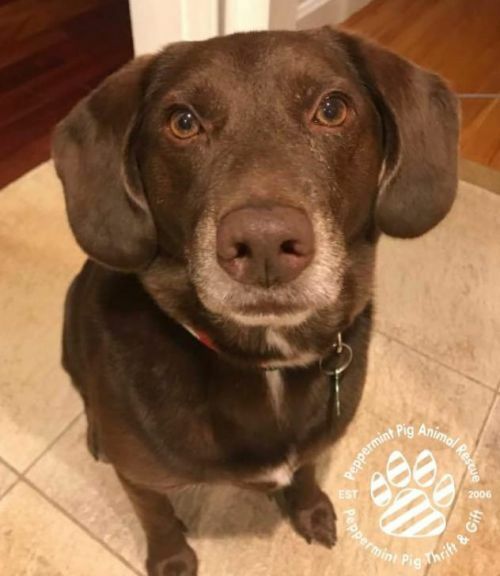 Adopter also agrees to maintain care and custody of the dog for its lifetime and will not sell, give, or otherwise transfer ownership or possession of the dog to another party. 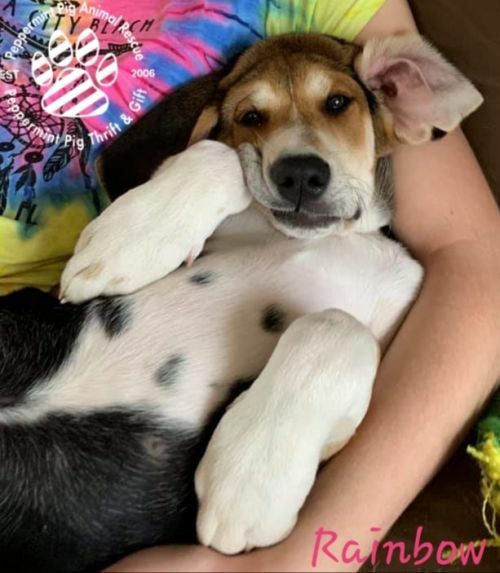 If, at any time during the lifetime of the dog, Adopter is unable to keep the dog, Adopter is required to notify PPAR and make arrangements to return the dog to PPAR. 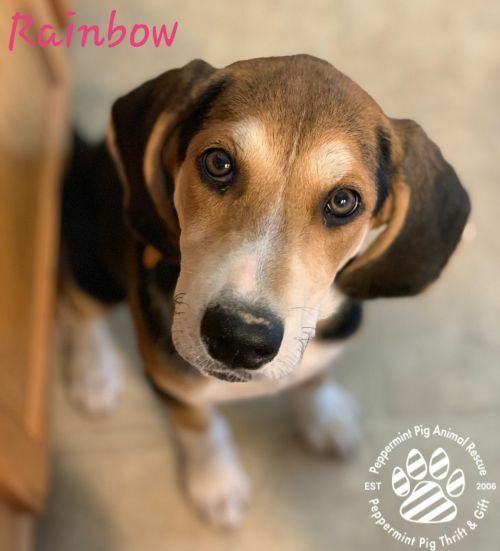 Adopter agrees that PPAR retains the right to contact Adopter, at its discretion to visit the dog and ascertain that these adoption conditions are being met. 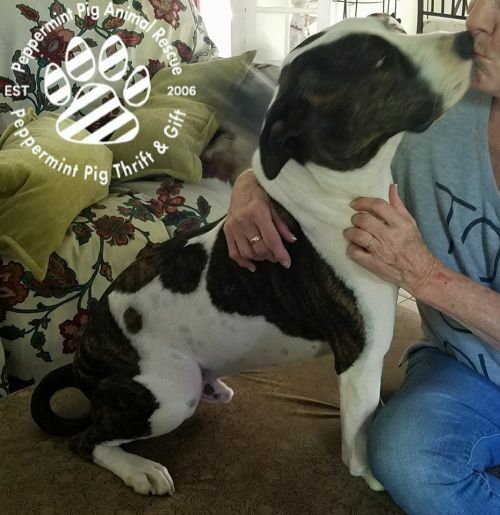 Adopter agrees that if the dog is picked up by the dog warden, found wandering or turned into a veterinarian/pound two times, upon the third time, the dog will be returned to PPAR and be cycled back into the adoption program. 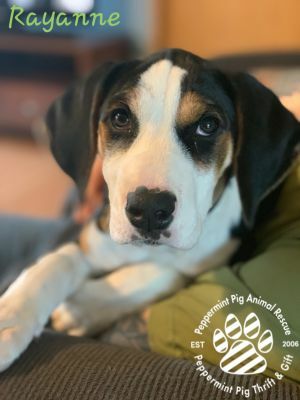 In signing this agreement, Adopter gives permission to PPAR and/or its designated agent, to remove the dog from Adopter's premises if the contract is violated. PPAR makes no warranties, no representations about the quality, condition, or suitability of the dog defined in this agreement. 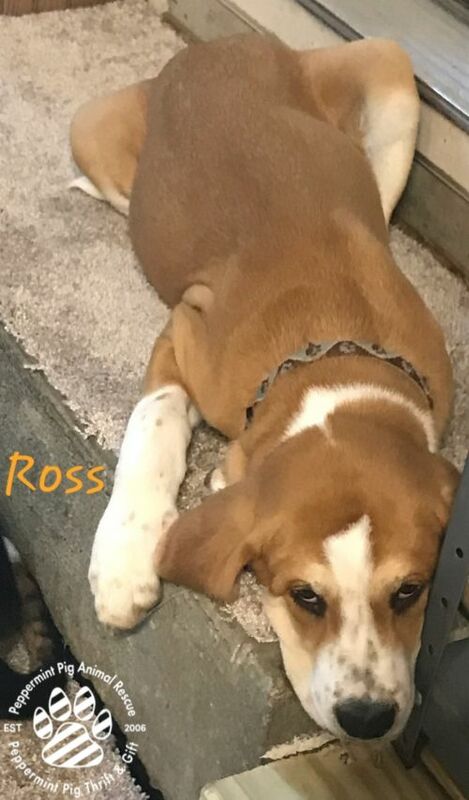 Adopter agrees to release, hold harmless and indemnify PPAR, its Officers and Directors, as well as the foster of the dog from any liability and all claims for losses and damages to persons or property incurred as a result of this adoption, or caused by the actions of the dog adopted herein. Adopter waives any remedy for damages which is not specifically contained in this Agreement. 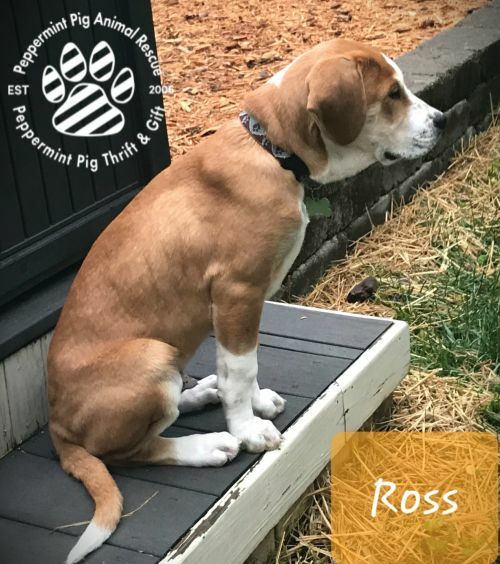 Adopter further agrees that in the event that this waiver of liability is found to be unenforceable by a court of law, any damages which may be assessed against PPAR will be limited to the amount of money given by the Adopter as the fee for this dog. This Agreement is the entire understanding between the parties. The parties are not relying on any prior communication of any kind. This Agreement may not be amended or modified without a written explanation and endorsement signed by the Adopter and an Officer of PPAR. This Agreement must be made in the appropriate court with the jurisdiction of Cincinnati, OH. The failure of PPAR to insist on the performance of any of the terms of this agreement will not waive nor bar future enforcement of such terms. By our signatures below, we, PPAR and Adopter, agree that we have read and understand and agree to the terms of this Agreement, and that the full Adoption Donation has been received by PPAR. 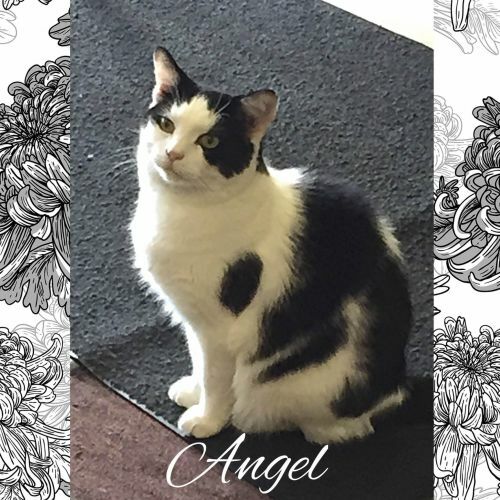 Angel is a White w/black spots female cat who gets along well with other cats. Would make a great addition to any home. She loves to lounge around anywhere in her home (which right now is our thrift store), loves being pet and getting cat treats! 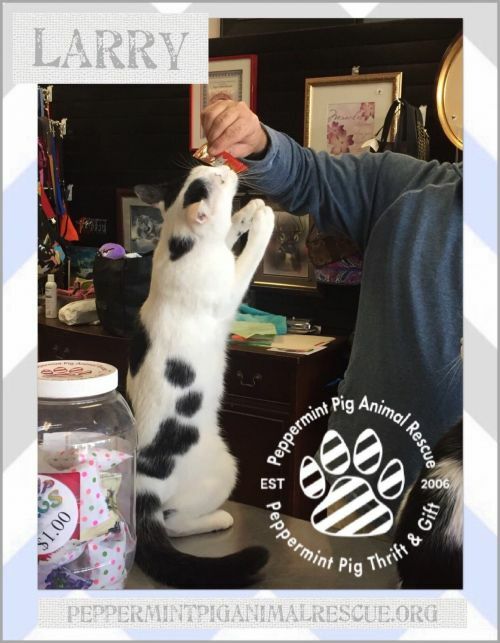 Peppermint Pig Animal Rescue is a no-kill rescue. 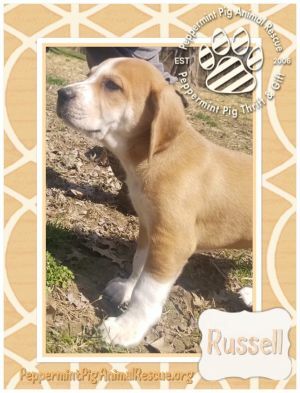 If you would like to sponsor this adoptable animal, click the SPONSOR ME box to make a donation. ALL donations allow us to help the animals you see here and many others. THANK YOU ! 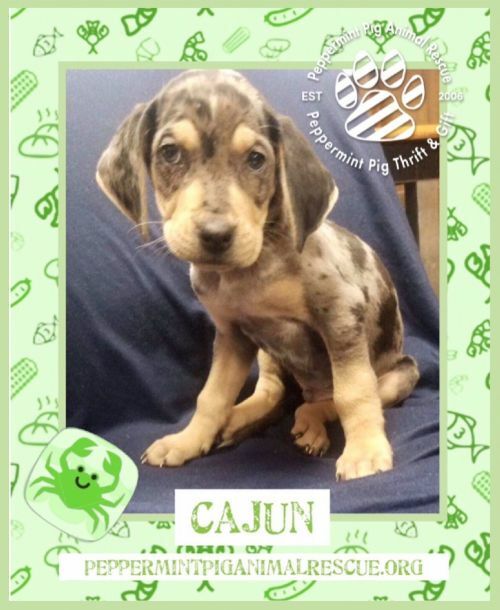 Adoption fee is $25 which includes shots and spay/neuter. 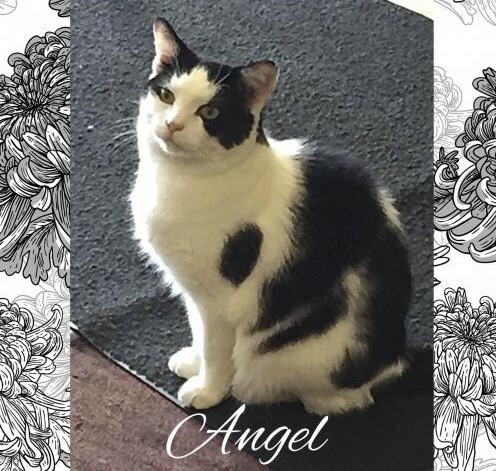 To visit Angel or inquire about her please call Peppermint Pig at 513-474-0005. 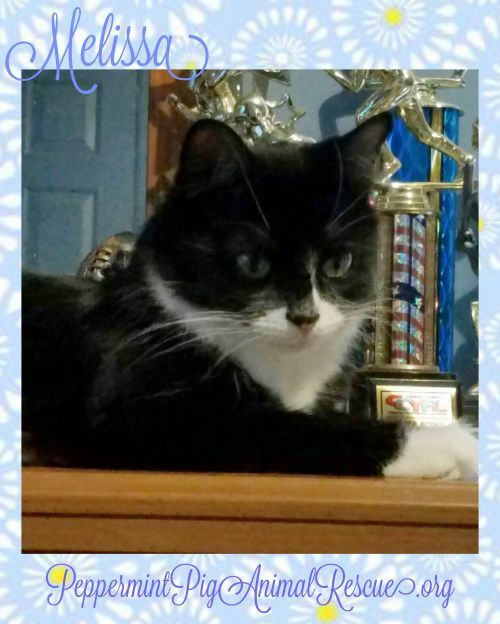 Melissa is a gorgeous young black and white female who does well with other cats and dogs. She is a very independent cat who is also fearless and quite comical to watch. She would do well in a busy household, as she is very content with amusing herself to pass the time. Melissa can be very affectionate when she is in the mood, but prefers the "look but don't touch" approach to making friends. She's not a "lap cat" but she will come to you when she wants your attention. Melissa came to us as a very young mother, she is vaccinated, FEL/FIV negative, spayed, and is now looking for her forever home. 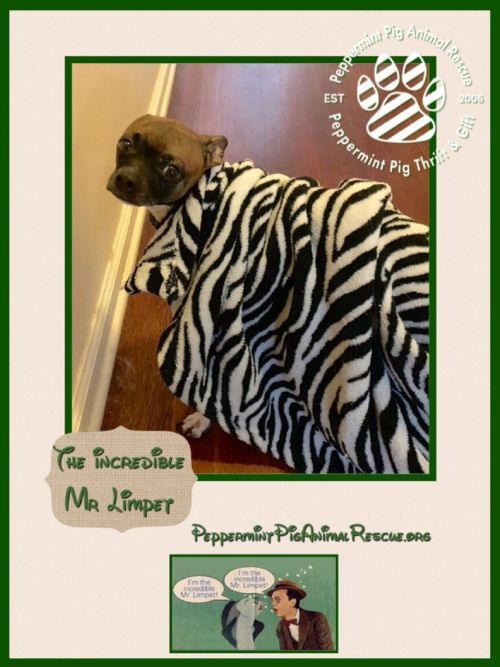 To complete our easy online adoption application, please visit our website peppermintpiganimalrescue.org. 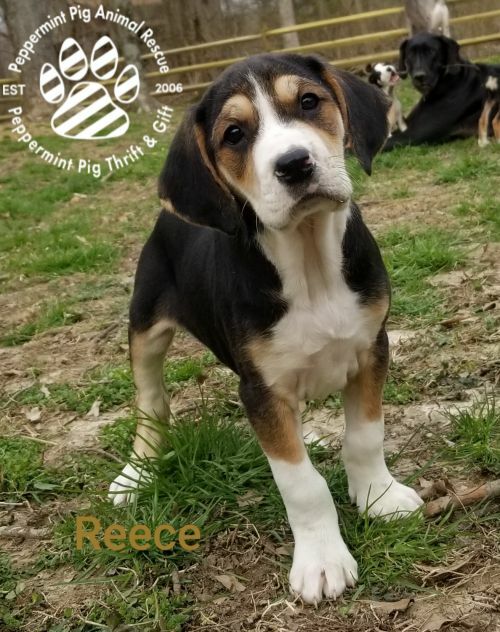 Adoption fee is $35. QUESTIONS? Email us at pparescue@gmail.com. 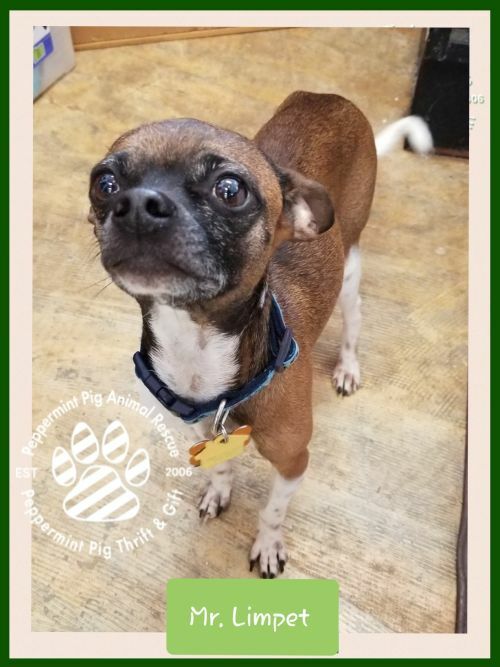 Peppermint Pig Animal Rescue is a no-kill rescue. 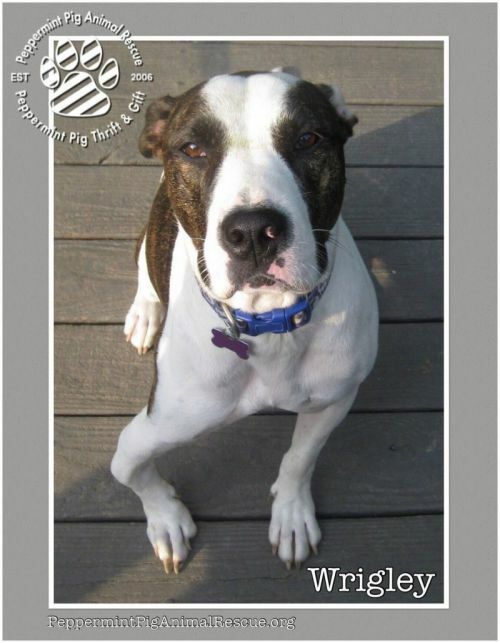 If you would like to sponsor this adoptable animal, click the SPONSOR ME box to make a donation. ALL donations allow us to help the animals you see here and many others. THANK YOU ! 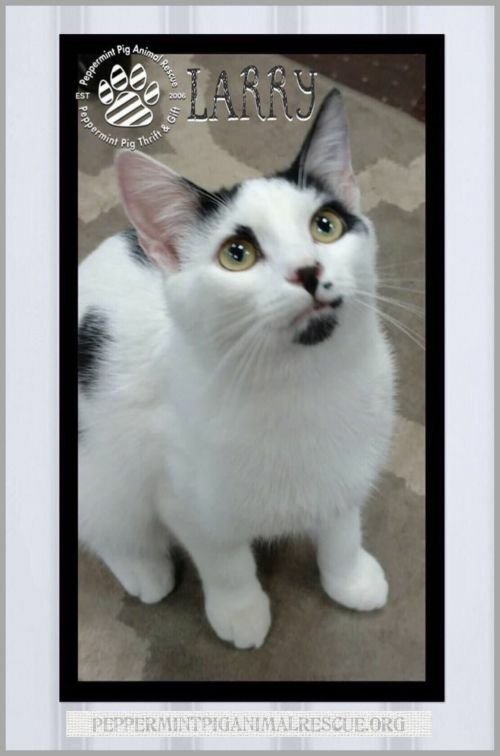 This adorable young kitty is searching for his forever home! 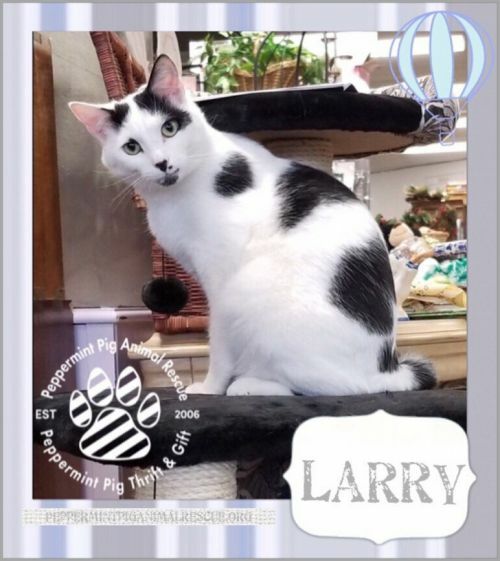 Larry is sweet-natured and affectionate, and has loads of personality, current on vaccines, neutered, and FEL/FIV negative. 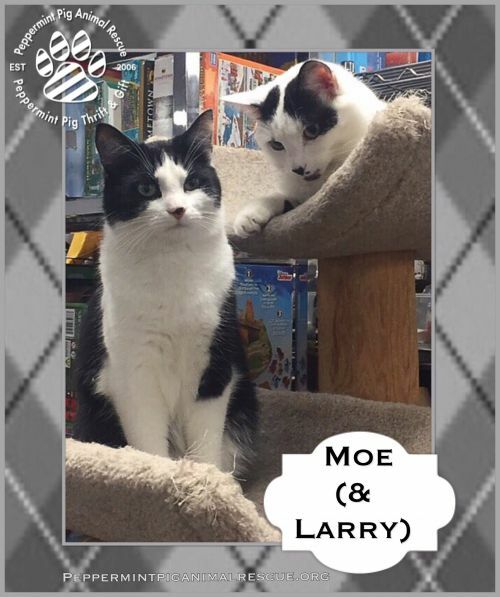 Meet Moe:: 2 years old, 10 pounds, Neutered Male Domestic Short Hair/Tuxedo Kitty. 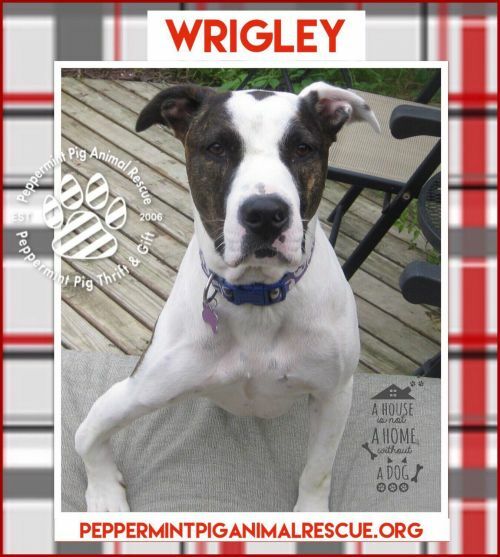 Wrigley is a 4 year old, 45 pound Neutered Male Hound & Terrier/Bully mix that we rescued from a high kill shelter. 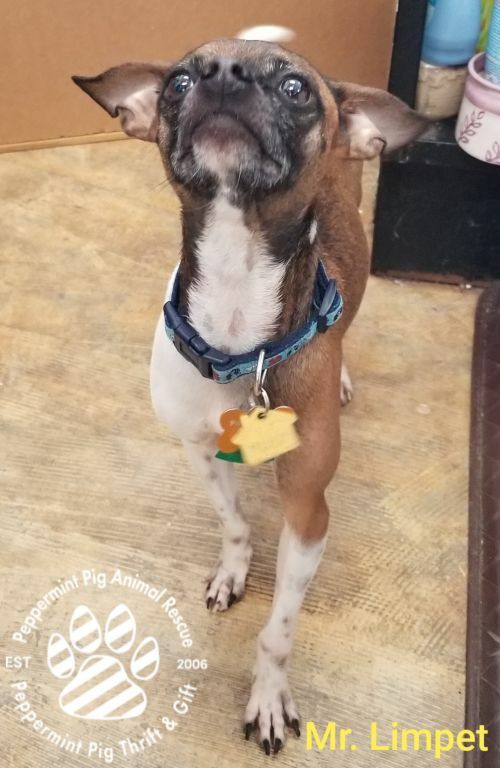 Poor Wrigley has been waiting for his forever home for over 2 years now! He is an such awesome and friendly young boy. Our vet says Wrigley's misshapen leg was broken at a young age and it didn't heal properly. We have taken him to see the orthopedic surgeon at The Care Center, and then to Ohio State for a second opinion. They both agreed that Wrigley's leg is not painful for him and surgery to correct it would only be cosmetic and come with an unnecessary and extensive recovery. We love Wrigley just the way he is. He is a total sweetheart and loves snuggles, long walks, and car rides. 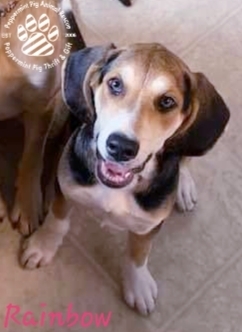 Wrigley is house broken, crate trained, knows basic commands, is well-mannered in the home and totally adorable! 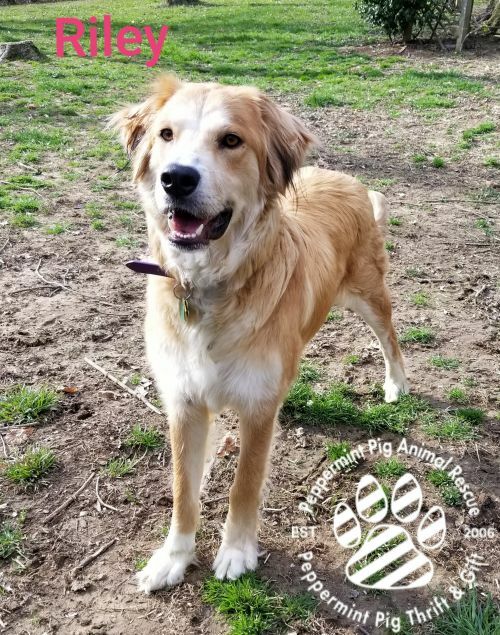 Wrigley just wants a forever family of his own to love and snuggle and a fenced in yard to run and play in! 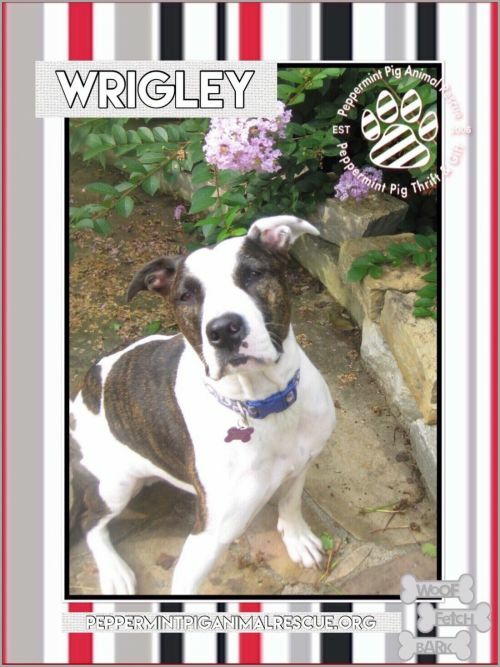 Wrigley is a special dog who needs a home without children or other pets. He bonds deeply to his people, so much that he wants to be the only one they love. Fenced yard is required to adopt Wrigley. 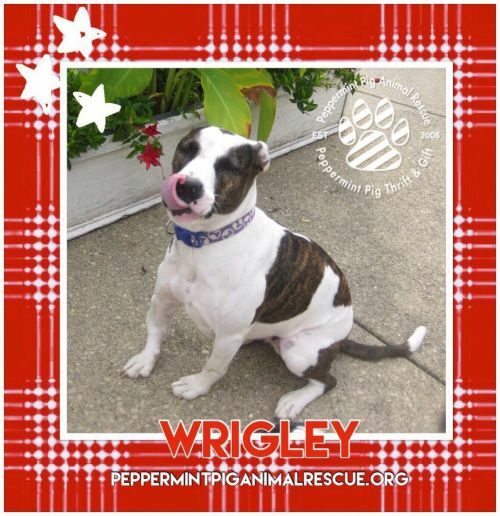 Wrigley's adoption fee is $95. 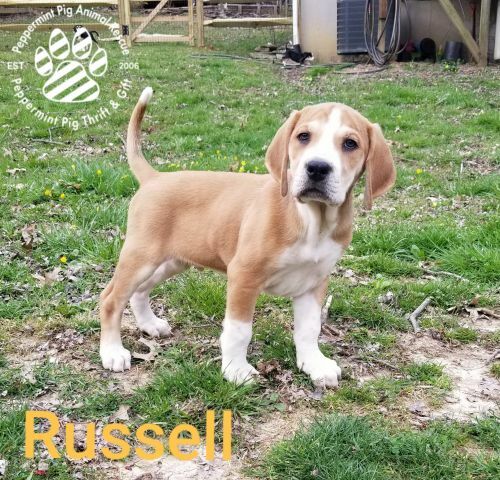 He is current on vaccines, heartworm tested negative, current on heartworm and flea prevention, neutered, dewormed, and comes with a lifetime membership microchip. 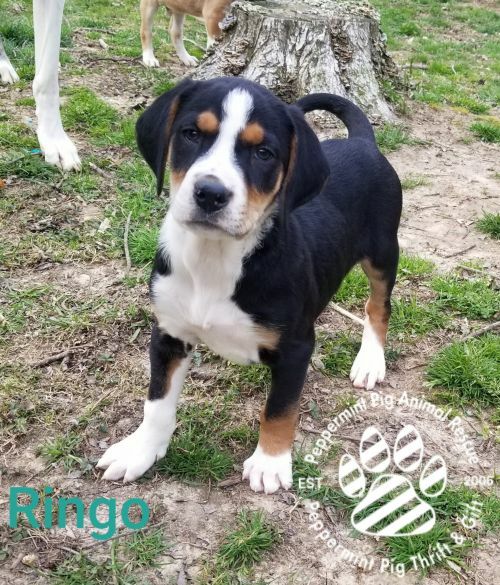 Our adoption area, unless otherwise specified in their bio, is within a two hour radius of Cincinnati for adult dogs. Meet Karl:: ~10 years old, 10 pounds, Neutered Male Maltese and Shih Tzu mix. Karl is such a sweet old man and gets along well with everyone. 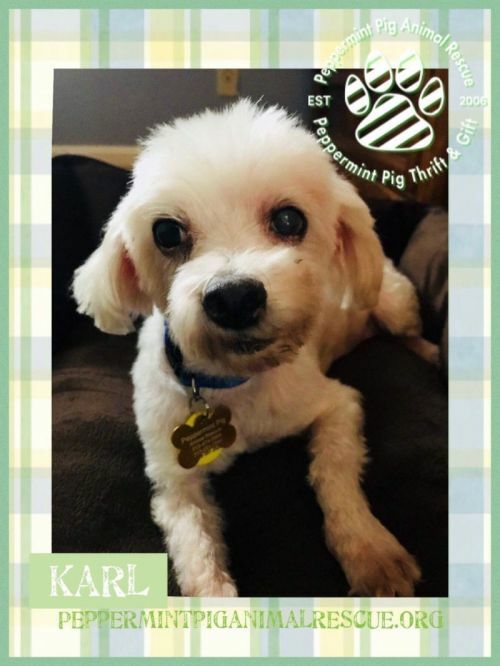 Karl is blind and hearing impaired, but it doesn't stop him from being the sweetest guy you'll ever meet! He gets around fine once he learns the layout of the house and loves to cuddle. 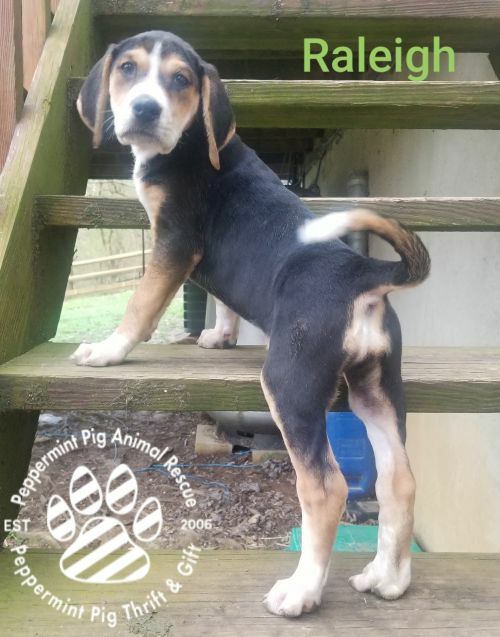 Karl has the sweetest personality, sure to win anyone over! A fenced in yard would be safest for Karl to have. 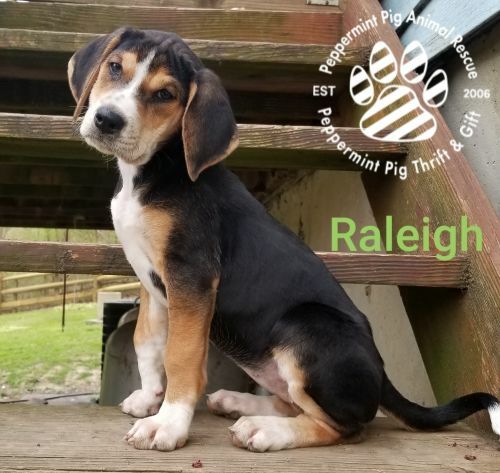 $95 Adoption fee. Karl is neutered, heartworm tested negative, current on vaccines, current on heartworm and flea prevention, and microchipped. Before completing the application, please read our ADOPTION PROCESS tab on our website. Adoption events are held every Saturday in our thrift store from 1:000pmto 4:00pm. 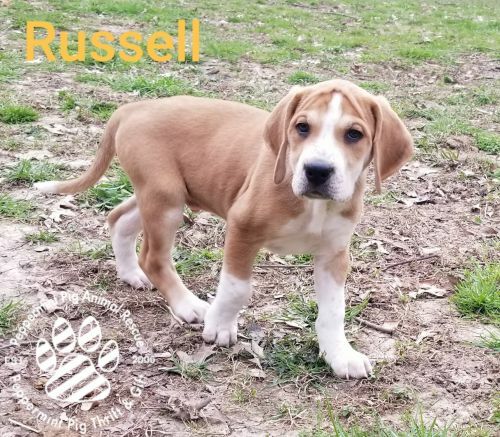 Please complete your adoption application in advance so our volunteers have time to screen and contact potential adopters. Midas is a sweet and gentle boy who has found himself searching for a new home. 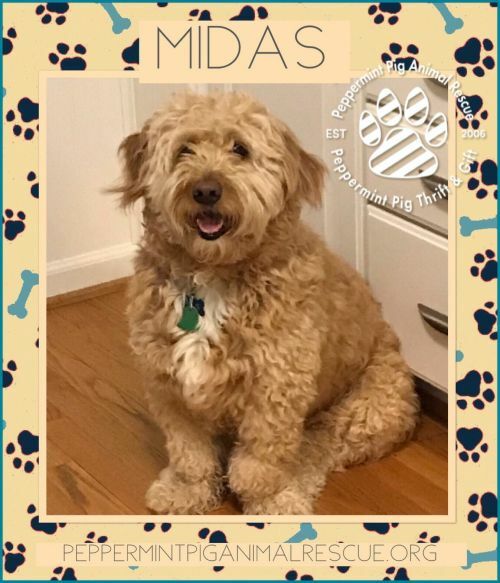 Midas is a good boy, and very affectionate, but he was not doing well with the new baby in the home, and he can be selective of his people. 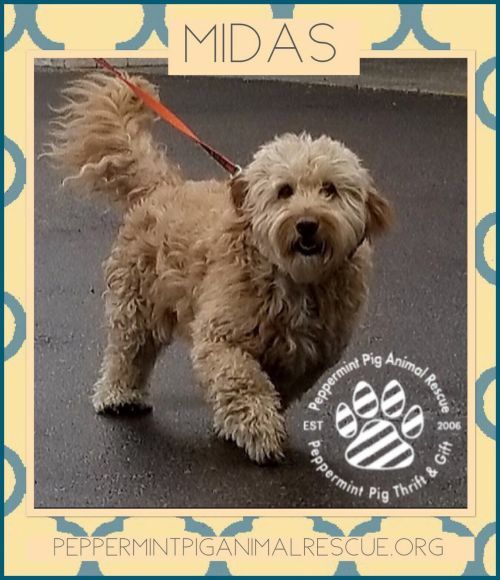 Midas will do best in a home without children. 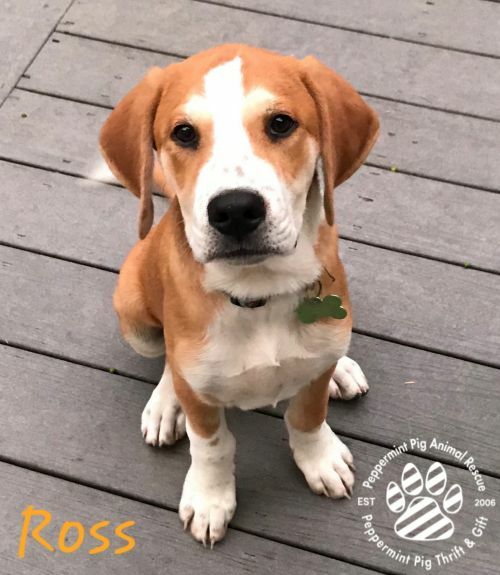 He does well with most other dogs, but can be a little selective over his dog friends at times too, he is housebroken, and very well-mannered in the home. 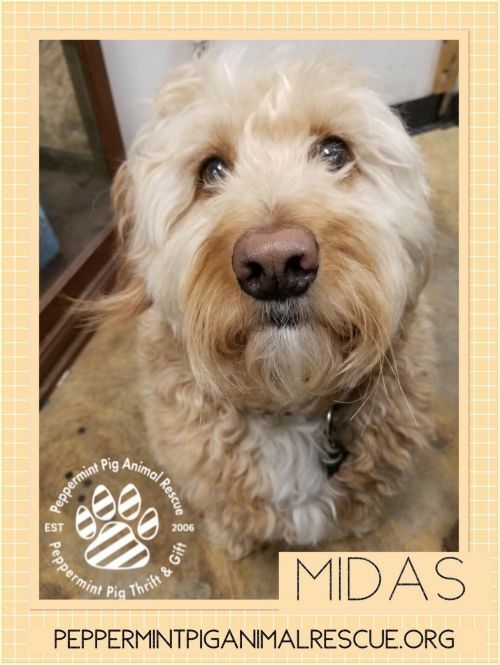 Midas is blind in one eye and requires daily drops to keep his eye healthy. 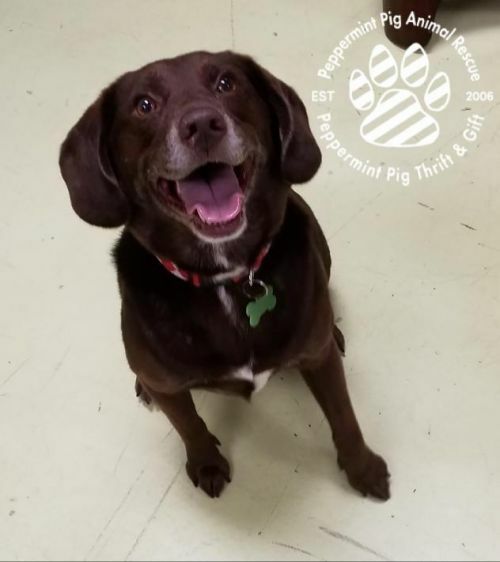 All Peppermint Pig Animal Rescue dogs come spayed/neutered, current on vaccinations, heartworm tested, current on heartworm and flea prevention, and microchipped. Along with other criteria evaluated in the application, a fenced yard is required to adopt. Please see our Fenced Yard Requirements tab on our website for more information. 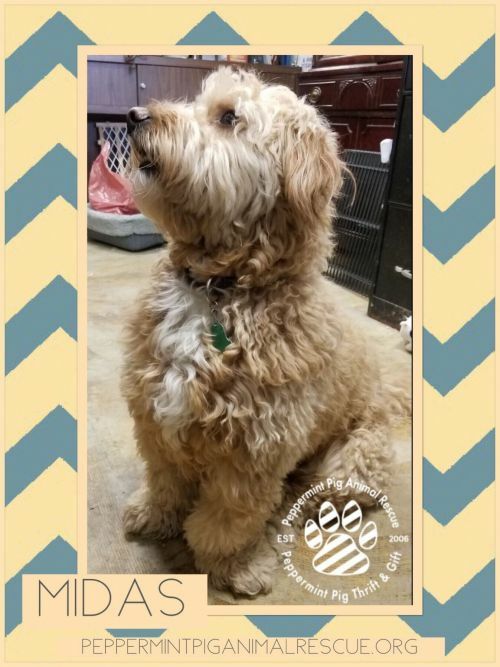 (Contrary to the many marketing claims made to appeal to people with allergies to pets, there is no such thing as a hypoallergenic dog breed, although some individual dogs may cause fewer allergy symptoms than others. The source of pet allergies is often a protein that's in the saliva and urine of dogs and cats. 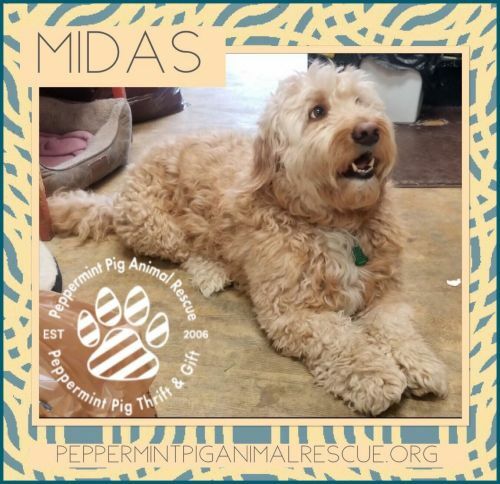 Midas is not a hypoallergenic dog breed. Meet TATER:: ~8 years old, 20 pounds, Neutered Male Chihuahua mix. 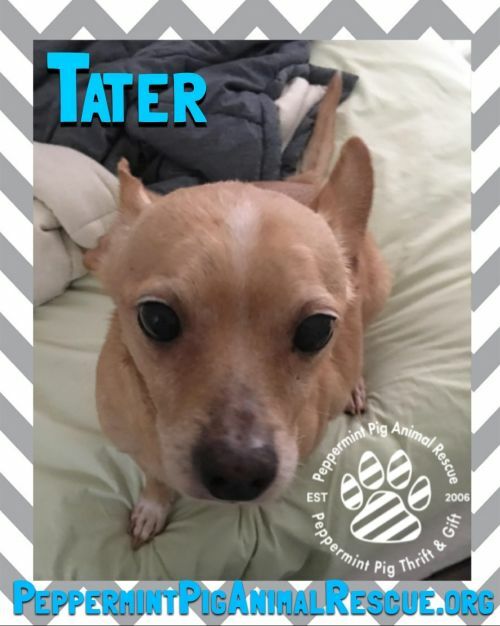 Tater is the sweetest, happiest, and friendliest little guy you will ever meet! Tater gets along well with his foster's other dogs and her pot bellied pig. 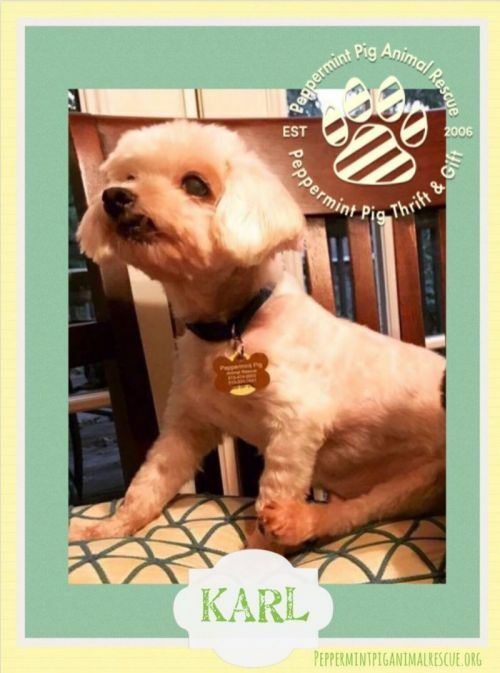 He is housebroken and well-mannered in the home and ready to find his forever home! 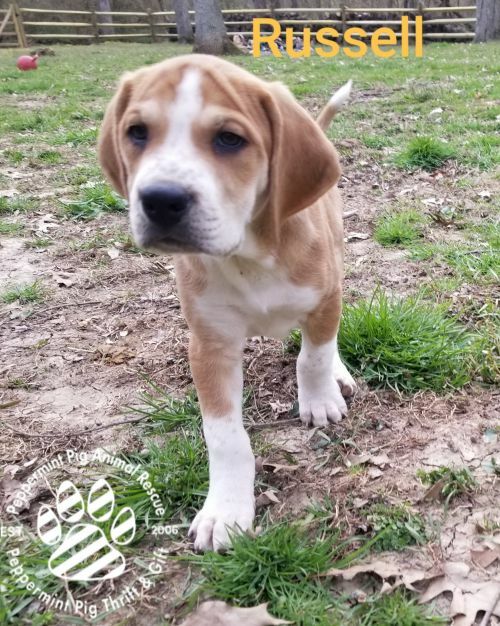 Tater's adoption fee is $95. Along with a thoroughly evaluated application, a fenced yard is preferred, but not required to adopt. 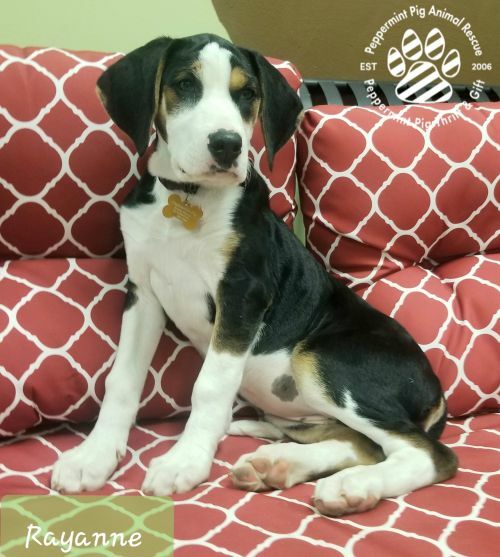 Our adoption area, unless otherwise specified in their bio, is within a two hour radius of Cincinnati for adult dogs. 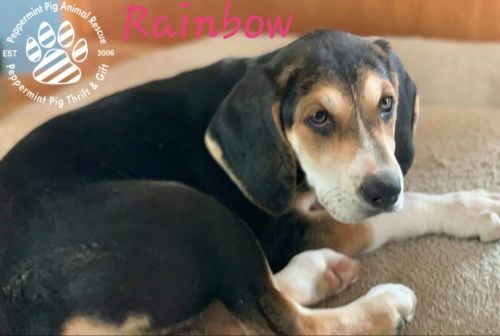 Please see our Adoption Radius tab on our website for more info. 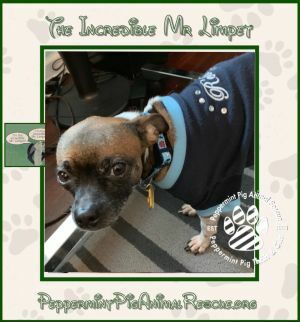 Meet the incredible, Mr. Limpet:: 4 years old, 10 pounds, Neutered Male Chihuahua mix. This incredibly sweet boy is Mr. Limpet! 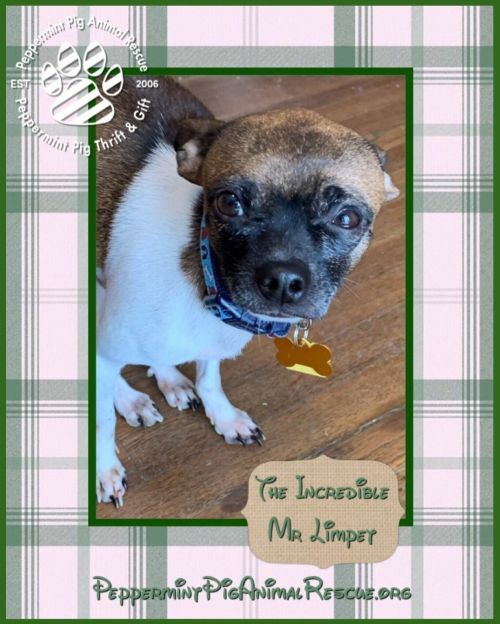 Mr. Limpet is a calm and affectionate little guy who loves to be held, curl up in your lap, or snuggle up in some warm blankets. 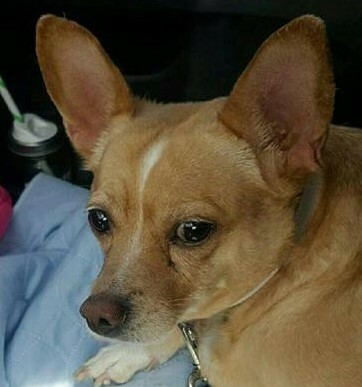 He does well with other dogs, but is a bit shy and scared when first meeting new people. Mr. Limpet bonds quickly and becomes an adorably affectionate little friend with the people he knows. 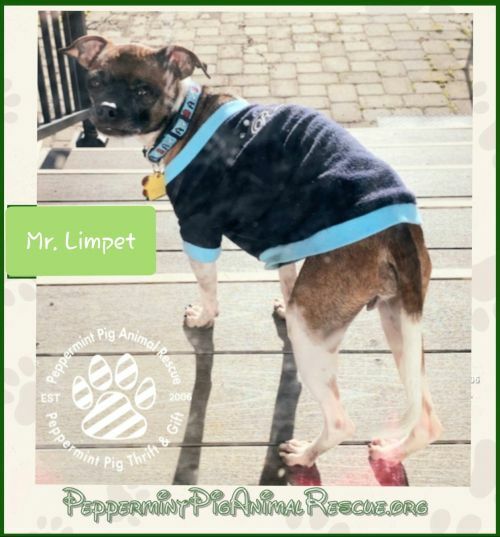 Mr. Limpet is doing well with pottying outside at his foster home and does well if he is crated when left at home. 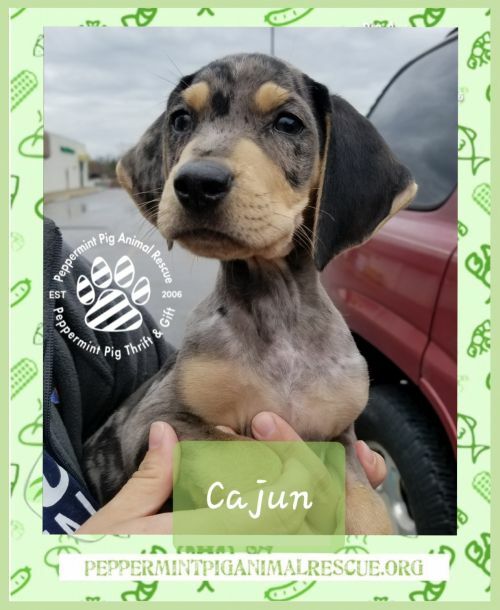 Meet Cajun:: 10 weeks old (as of 04/11/19), 14 pounds, Male Louisiana Catahoula Leopard Dog. 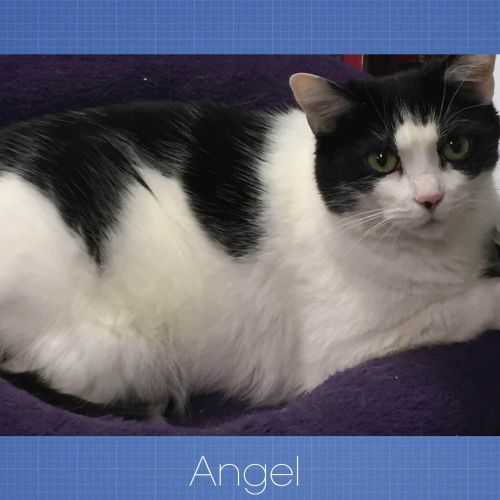 Playful, affectionate, and so sweet! 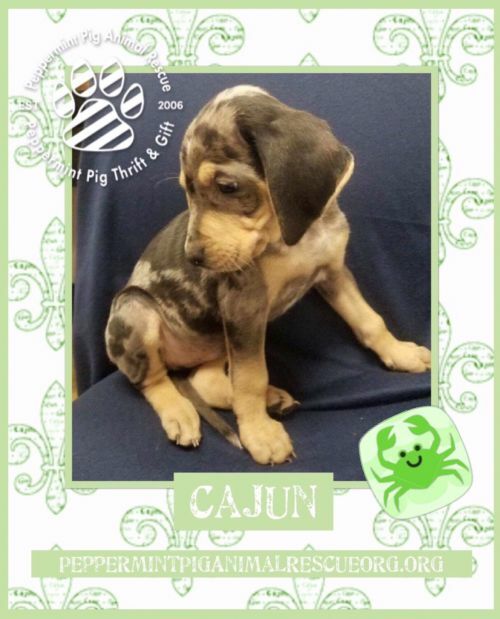 Cajun is searching for his forever home! 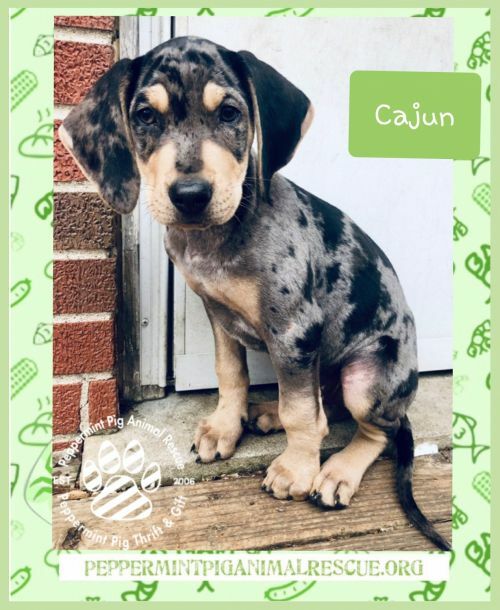 Catahoula Leopard Dogs are known for their independent personalities and loyal nature. They will require active families who will socialize and train them very early on. Their families should have experience with training similar, intelligent, high energy breeds. These will be large dogs when fully grown, ranging from 50-95 pounds. 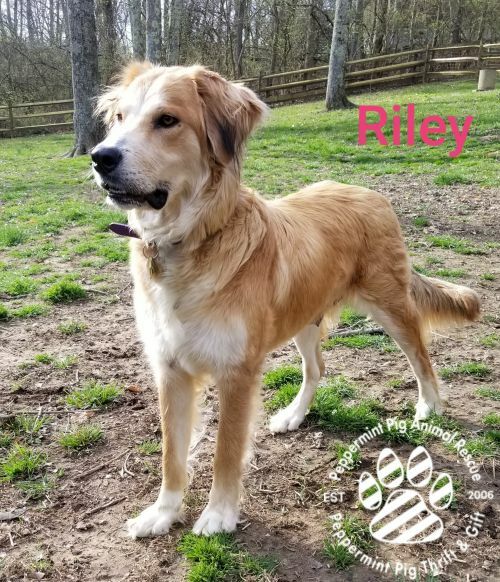 Meet Riley:: 1 year old, 63 pounds, Spayed Female Golden Retriever mix, mom to the R puppies. Riley is just the sweetest young girl! 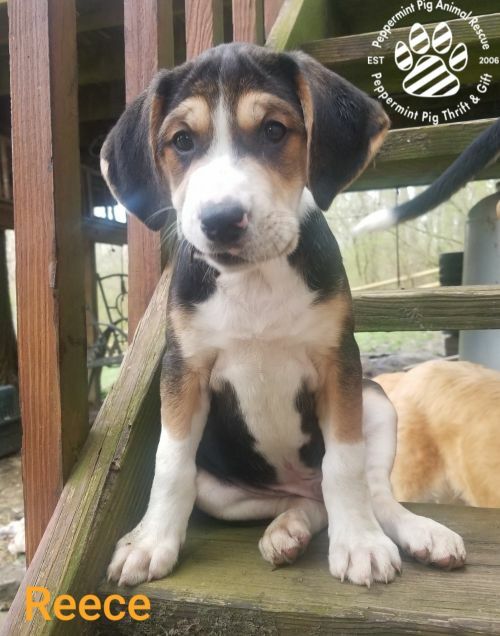 Riley was found under a house in Kentucky with her 9 puppies (R pups). She gets along perfectly with other dogs, and all people. 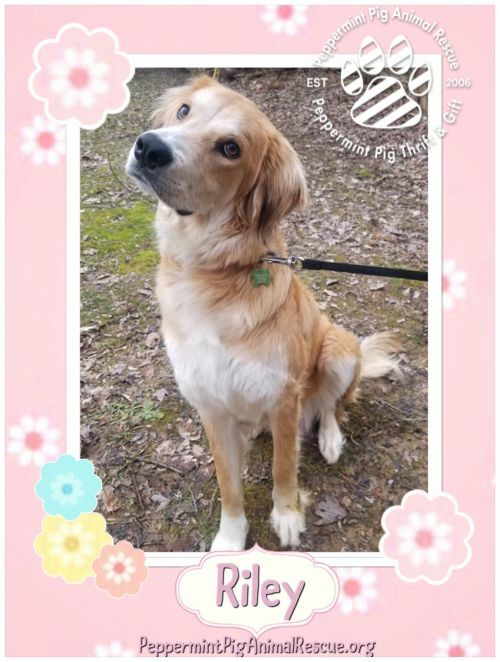 Riley is very well behaved in the home, does well in a crate if needed and she is house broken. 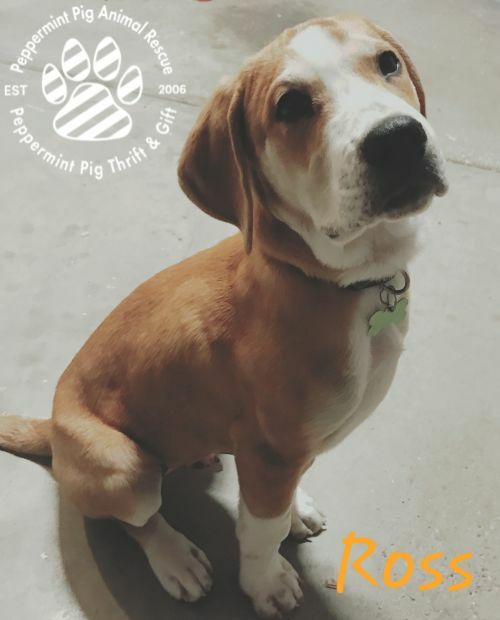 Riley's adoption fee is $120. 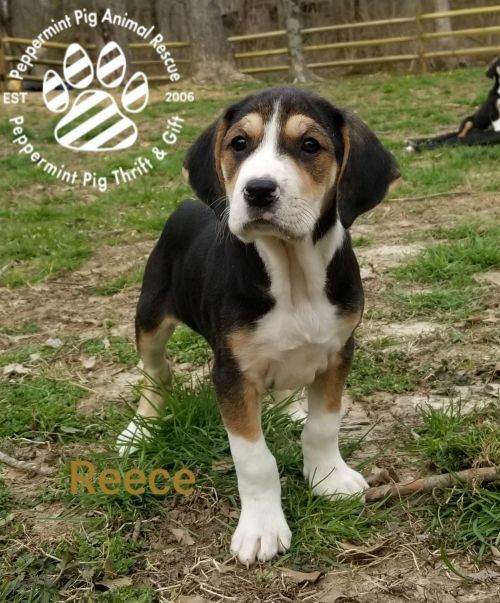 REECE HAS A PENDING ADOPTION, HIS PROFILE WILL BE REMOVED ONCE HIS ADOPTION IS FINALIZED. PLEASE VISIT PEPPERMINTPIGANIMALRESCUE.ORG TO VIEW ALL OF OUR ADOPTABLE RESCUE PETS. THANK YOU. 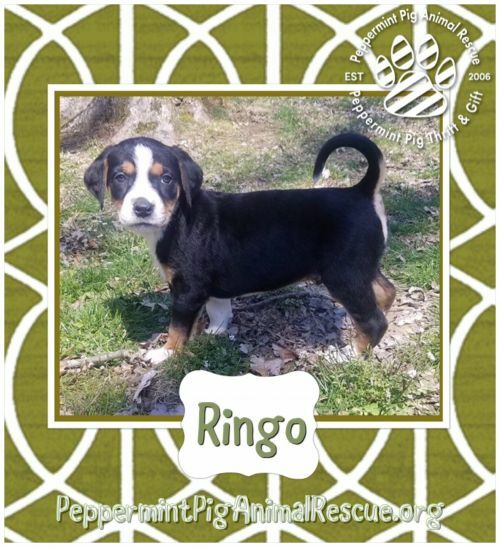 RINGO HAS A PENDING ADOPTION, HIS PROFILE WILL BE REMOVED ONCE HIS ADOPTION IS FINALIZED. 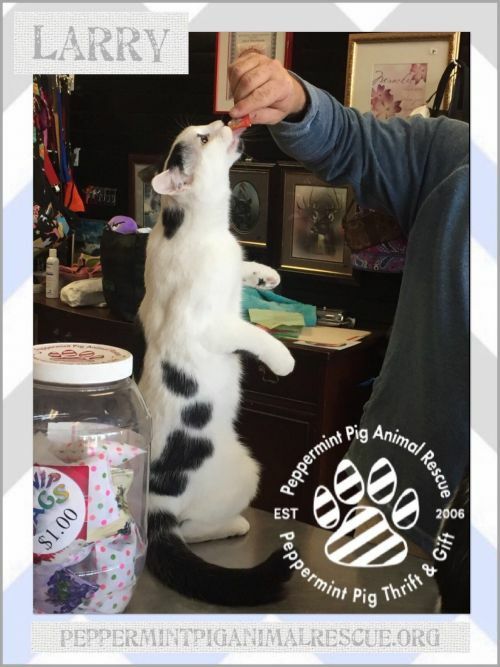 PLEASE VISIT PEPPERMINTPIGANIMALRESCUE.ORG TO VIEW ALL OF OUR ADOPTABLE RESCUE PETS. THANK YOU. 8 weeks old on 03/27/19. Ranging from 8 to 14 pounds. 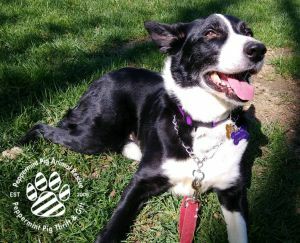 Meet Gloria:: ~4 years old, 45 pounds, Spayed Female Border Collie mix. 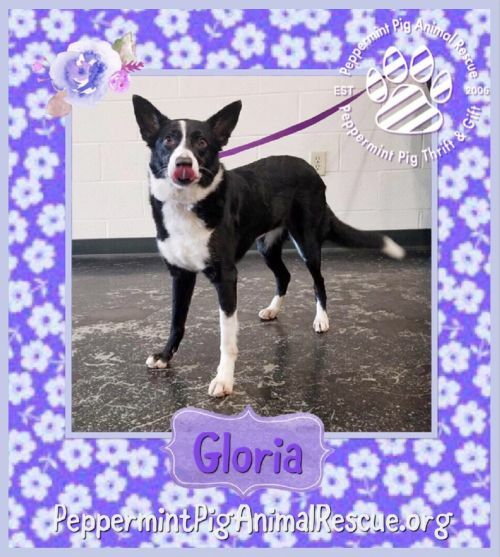 Gloria is such a sweet girl who just loves people! 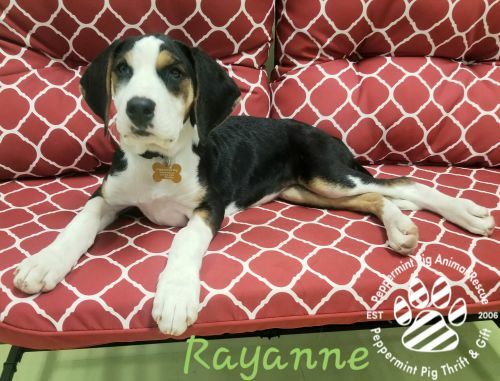 She gives kisses freely and is happy to perform commands for a squeak toy or a treat. 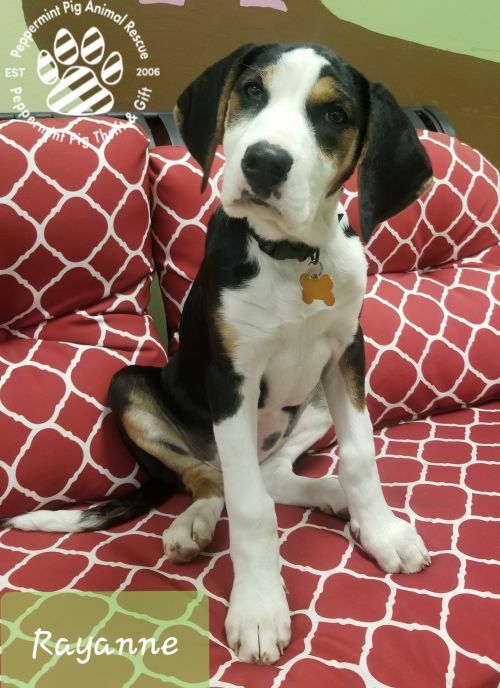 Gloria is very intelligent and ready to take on any new learning experiences, she is so fun to teach new tricks and commands! 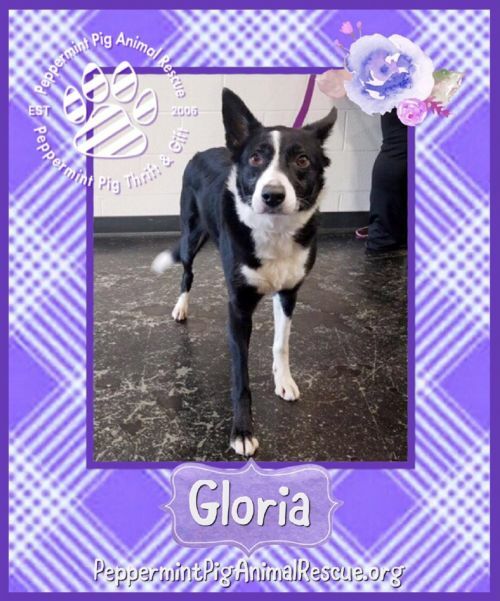 Gloria does well with calm, male dogs, but she can be a little defensive with some female dogs. 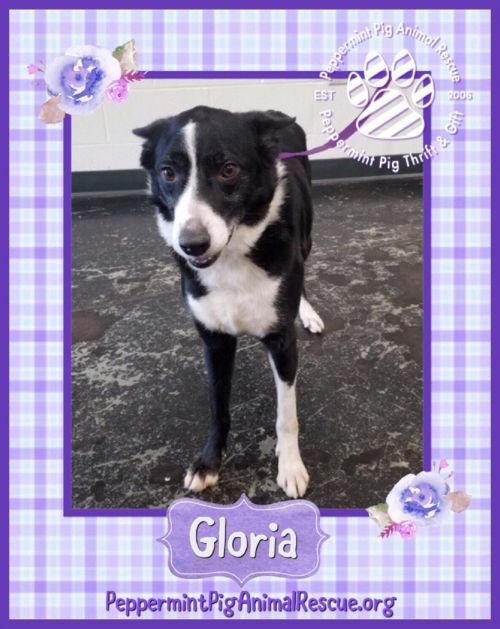 Gloria is housebroken, very well-mannered in the home, and crates well if needed. 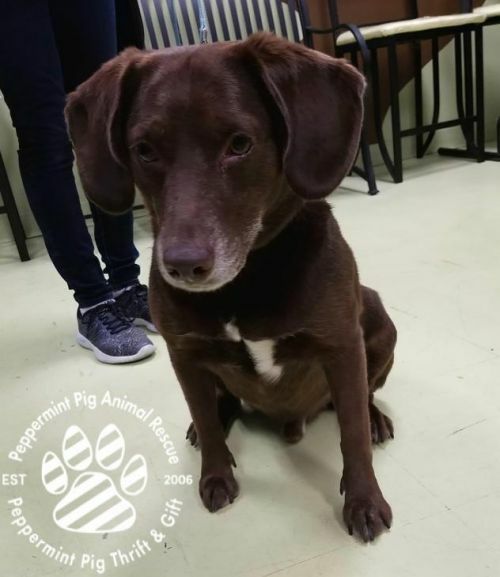 Meet WALTER:: Neutered Male Chocolate Lab mix, 5 years old, ~35 pounds. This guy is just great all around! 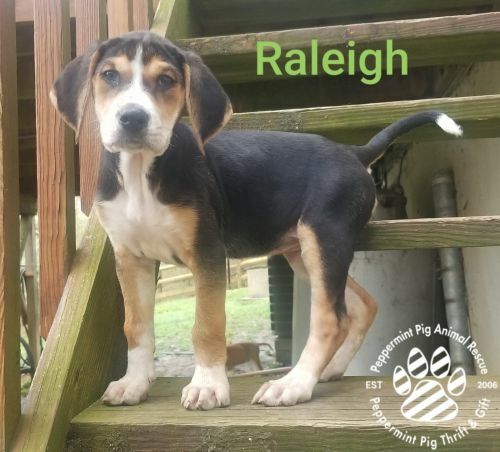 Happy, playful, intelligent, and gentle! He is such a sweet boy and so eager to please his people. 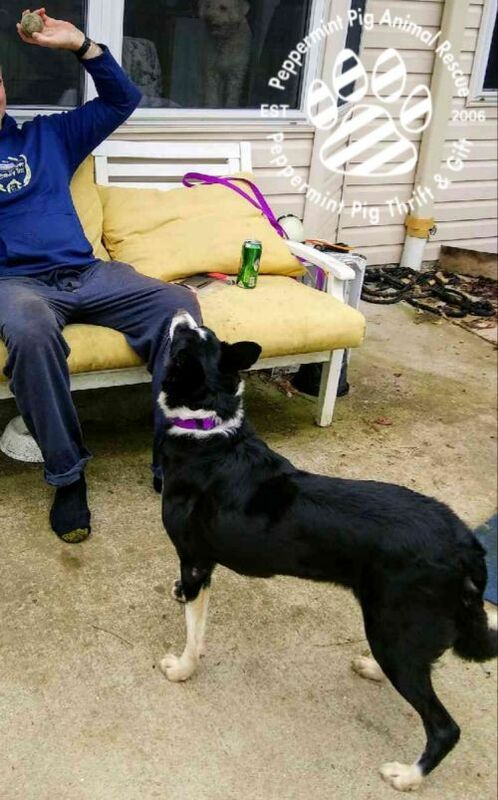 He gets along great with other dogs and is good with kids, and house broken. Walter is searching for a family to love forever! Walter is housebroken and requires a crate when left alone. 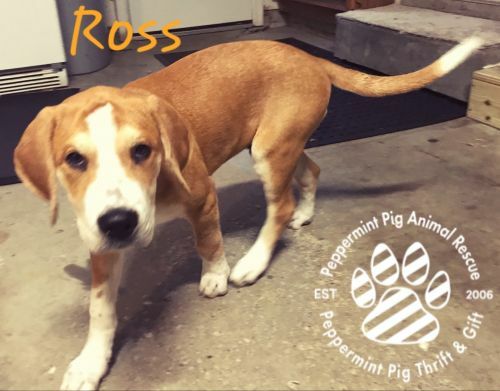 Our adoption area, unless otherwise specified in their bio, is within a two hour radius of Peppermint Pig Animal Rescue for adult dogs. 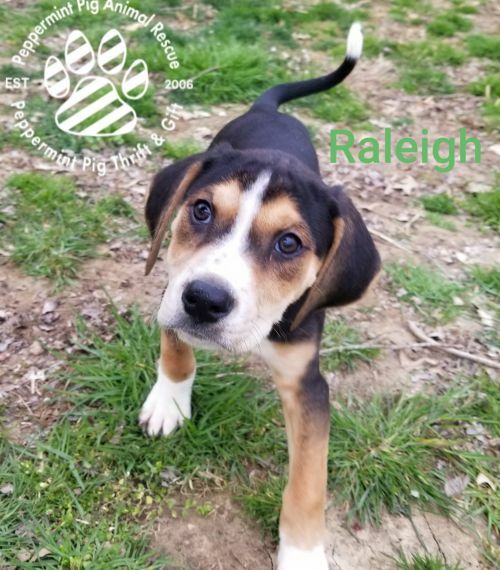 Please see our Adoption Radius tab on our website for more info.